“Dad, I am going to die in two seconds!” she screams. “GET ME DOWN!” Quinn’s wail of hyperbolic doom echoes off the cobbled walls of Maple Canyon. Even the birds stop singing momentarily, as if waiting to hear what would happen next. He knows what he is talking about. Eighteen years ago, Aaron Hopkinson introduced me to rock climbing at a sandstone crag below Lake Tenkiller Dam in Oklahoma. Nearly two decades later, he’s been the de facto Dean of Climbing Education for the ten kids in our two families. From the time they’re big enough to fit into a full-body harness–about age two–the tutoring begins. The kids are tied in, dangled, and swung. They’re taught to trust the gear and get comfortable with the rock. Admittedly, the prospect of taking small children rock climbing seems daunting. Some people might even call it irresponsible. But I’m not talking about teaching four year olds to aid climb in Zion National Park. I’m talking about taking kids to any number of nearby sport climbing destinations, introducing them to climbing as a new way to have fun with family and friends, and doing it safely. Climbing adds a new dimension to family camping and day trips. Don’t worry; it isn’t hard. Here are some tips to help make it part of your family’s adventure repertoire. Not all crags are easy, or fun, to access. Some approaches are almost as tricky as the climbs, and the belay areas at some climbing walls are not exactly family friendly. Nearby drop-offs, torrential streams, and a lack of flat ground are obvious hazards to avoid. Choose climbing areas that don’t require long, steep, or scrambling approaches. The best family crags have clean, established routes that minimize the chance of rockfall. They also have lots of space at or near the belay area where kids can entertain themselves while awaiting their turn on the wall. Look for shady spots with relatively flat ground. Let’s face it, tiny gear is cute. Most climbing gear vendors have caught on to the need for miniaturization. Harnesses, shoes, helmets, even chalk bags are easy to find in kid sizes. Preferably before you go, help kids get familiar with the gear they’ll be using. Make sure your child’s equipment fits before you put them on the rock. 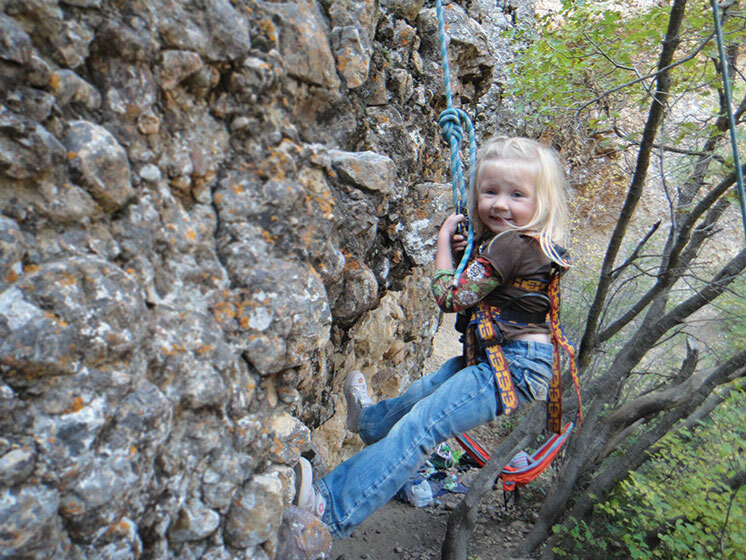 The harness is the most important part of a child’s climbing ensemble. Kids five and under should use a full-body harness that ties in at chest level. Wearing a helmet is also advisable. Practice putting on the harness and tying in. Teach your little climbers how the rope and harness work together to keep them safe, and show them how a belay device works. You might even consider letting them hang or swing in the harness before getting on the wall. Playground equipment is a perfect proving ground. This one goes without saying. Some kids will approach rock climbing fearlessly, others with trepidation. And those feelings may flip-flop. 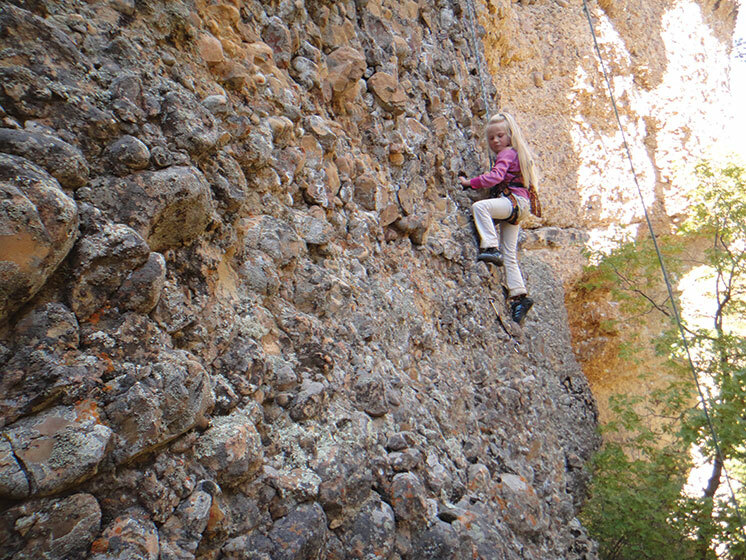 In the story that begins this article, nine-year-old Quinn screams in frustration and fear on a 5.4 climb she had completed without tears only a week before. Try not to put a young climber on anything harder than 5.5 for their first climb. The easier the better. In fact, rigging a toprope on a short fourth-class scramble might be the best route for a nervous first-timer. It lets them experience using the equipment, but also gives them the greatest chance of succeeding on their first climbing route. Progress slowly to harder routes, and give regular encouragement. But don’t be afraid to let kids try climbing above their grade. They’ll quickly grow to appreciate the challenges of the sport and look forward to getting better. Some kids have short attention spans and are prone to quit when things get too hard or too scary. One trick we use is placing candy or quarters as rewards along the climb. This helps kids concentrate on climbing rather than falling and gives them tangible goals to reach for all the way to the top. We’ve also found that, for our kids at least, having friends on hand adds an extra level of motivation. Candy’s grand, but nothing is sweeter than bragging rights. The tips in this article will help get your family on the rocks, in a good way. However, keep in mind that climbing can be dangerous, especially if you aren’t familiar with the gear or don’t know how to rig anchors, identify hazards, or teach basic climbing principles and techniques. If you haven’t yet met these prerequisites, go with someone who has. Family adventures ending in an emergency room are learning experiences, but it’s best to avoid them in the first place. This popular canyon in Provo is jammed with hundreds of well-bolted sport climbs from 5.4 to 5.13. There are lots of great areas to choose from in Rock Canyon, but two stick out when kids are involved. The Kitchen is a busy spot because of its accessibility, but you can usually find a place to rig a toprope. To get there, walk up the main canyon trail until just before you reach a gate. Look right, and you’re there. If The Kitchen is a zoo, head up the trail a little further until you pass two concrete retaining walls on your left. Cross the stream bed and take the left fork in the trail up to the climbs. My four-year-old still brags about bagging the 5.4 route on the far left. Adults craving a challenge can tackle The Bulge, a canted, overhanging 5.11d in the middle of the wall that’s one of my college favorites. This route-rich sport crag in the mountains northwest of Ephraim, Utah, is famous for its cobbled walls and summertime crowds, but once you’ve been there, you’ll know why. The best area for kids in Maple Canyon is the aptly named Schoolroom. Park at the restrooms on the north side of the road, just before you get to the campground. Follow the trail up for just a few minutes to find Schoolroom tucked into the alcove on your left. The route furthest to the right in the alcove is Bob’s Bolts, a kid-friendly 5.4. If this area is full, and it fills quickly, continue up the trail and try out the climbs bolted on the right. I don’t have experience with these routes, but they seem pretty good for beginners. A quartzite gem at the south end of the Salt Lake Valley. Red Rock’s bolted routes start at 5.6. This is a great place for an afternoon of fun on the rock with the fam. Routes are labeled with names and ratings, and there’s room for kids to hang out and wait their turn. The approach is less than a quarter-mile from a parking area on the south side of Mike Weir Drive, after taking the west exit from the traffic circle.